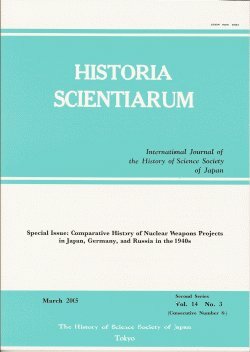 Historia Scientiarum (ISSN 0285-4821) is the international journal of the History of Science Society of Japan. It was established in 1962, titled as Japanese Studies in the History of Science, and renamed to the present title in 1980. It is published three times a year, containing articles, notes, documents, and reviews, which are written in English, German, or French. For international subscribers, Historia Scientiarum is distributed by Japan Publication Trading Co., Ltd.
P. O. Box 5030, Tokyo International, Tokyo 100–3191, Japan. Editional Members: Yasu FURUKAWA, Keizo HASHIMOTO, Kaori IIDA, Kazuyuki ITO, Boumsoung KIM, Taro MIMURA, Hajime MIZOGUCHI, Hideto NAKAJIMA, Takuji OKAMOTO, Sayaka OKI, Yasushi SATO, Kazuhiro SHIBATA, Mai SUGIMOTO, Akihito SUZUKI, Ken’ichi TAKAHASHI, Tokimasa TAKEDA, Michiko YAJIMA, Toshihiro YAMADA, Akira YOSHIDA.